One fine morning, I sauntered into the eastern fringes of Kitsilano, catching a few whiffs of my favourite type of fragrance: the sublime, heart-warming scent of Japanese cuisine breathing life into the crisp, wintry air. The streets were adorned with a number of quaint, picturesque restaurants and boutiques, each of them just as tranquil as its neighbours. I had arrived too early for lunch, much to my chagrin. With my gut growling and my craving for Wi-Fi flourishing, I stood just a few paces from the entrance of Sushi Bella to snaffle some of their divine Shaw Open radiation and peruse some of the freshly minted messages in my inbox. Okay, that was enough fun with my thesaurus. 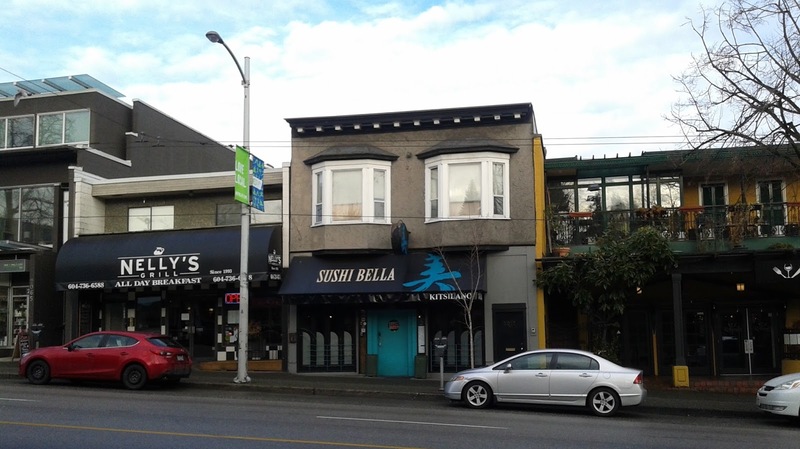 Sushi Bella is one of Greater Vancouver's most popular restaurant chains with a total of four locations. Being the first customer of the day, I was greeted by the friendly Korean staff and seated not far from the front entrance. Here, the strong sunlight pouring in from the south-facing windows created a sharp contrast with the darker lighting in the back of the restaurant (a.k.a. the uncomfortable kind of lighting). As soon as I got out my notebook, the waiter and the chefs suddenly stopped talking, and all that could be heard were the faint sounds of knives cutting through sushi and the soft jazz music in the background. Taking advantage of their lunch specials, I ordered the $15 Sashimi Bento, and the first thing to arrive was the Miso Soup. 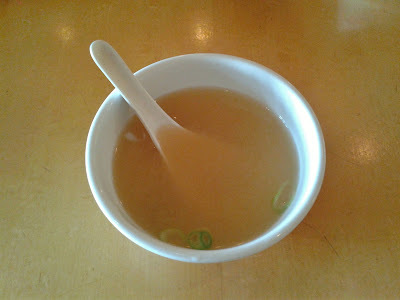 The Miso Soup had a thin consistency, but was not too salty and served at a comfortably hot temperature. A few minutes later, the rest of my Sashimi Bento arrived. Given the portion sizes, I would say that $15 is on the pricier side. 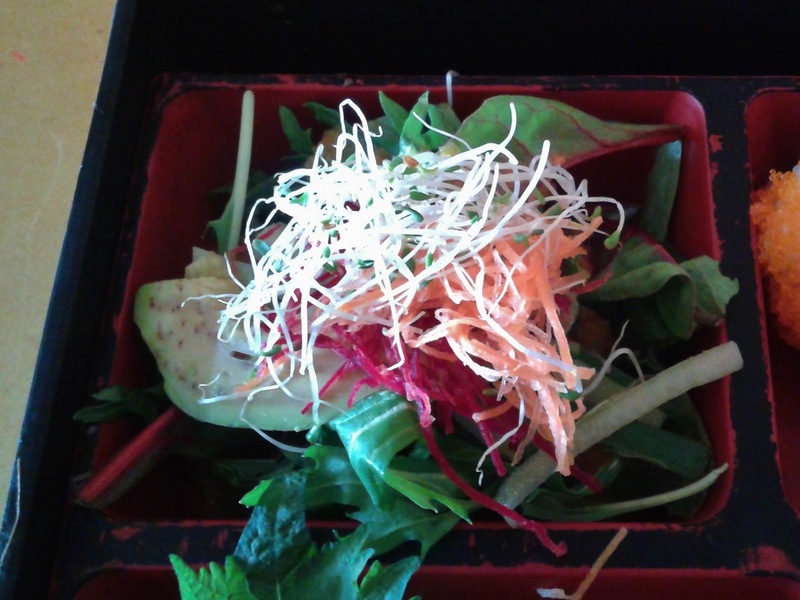 The Salad came with finely grated daikon and a slice of nearly overripe avocado on mixed greens. The dressing was a tangy vinaigrette, with an extra zing provided by finely grated onions. Most of the dressing sank to the bottom, and for good reason: avocado and tangy vinaigrette dressing produce a rather revolting combination. 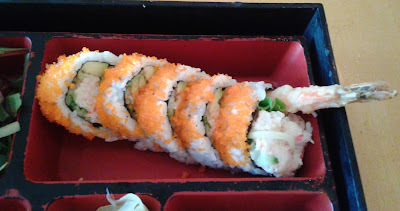 The Dynamite Roll was served cold and tasted like it had just been pulled out of the freezer. I was not impressed. There was an abundance of imitation crab filling, but this filling was overly creamy and strangely stuck together in a clump. There was no fishiness in the Tuna Sashimi at all, but it had a very interesting texture. Parts of it were very soft and tasted watery, while other parts were significantly firmer. It took me back to my childhood and reminded me of those water blisters that would appear on my mother's steamed buns when she forgot to remove the lid of the steamer after heating the buns up. 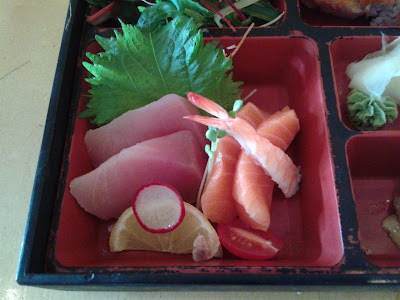 The Salmon Sashimi was fresh with a nice creamy flavour, but all of this was destroyed by the flawed cutting. There was a weird, mushy flap extending from the bottom of each piece. Nope, let's not think about that and just move on. The Ebi Sashimi was the least flawed and had a pleasant sweet taste, but it was slightly too tough for my liking. 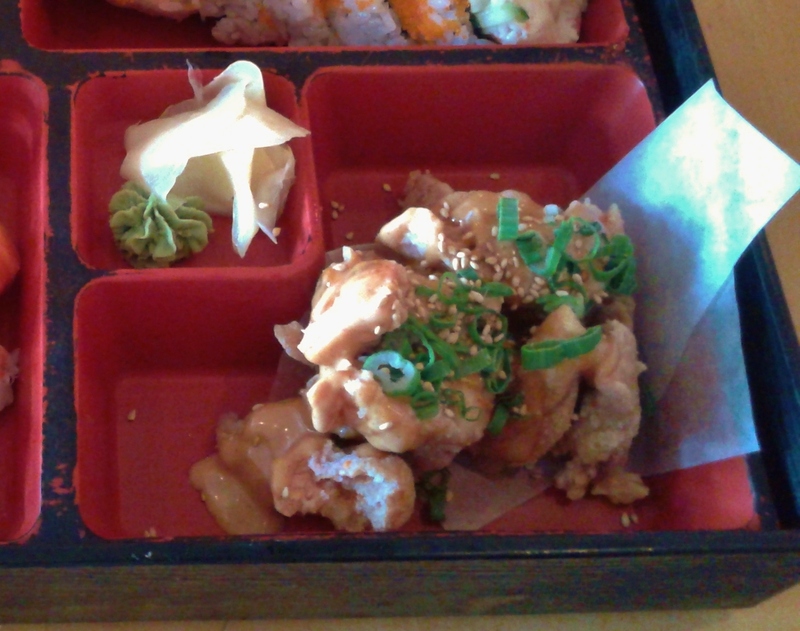 The Chicken Karaage was slightly crispy and dressed with a light layer of katsu mayo, which was delectably tangy and creamy and worked well with the chicken. Unfortunately, the chicken was not tender and hard to chew in places. The final dish of my lunch was the Lobster King Roll, which came with lobster meat, avocado, cucumber, tuna tataki, roasted garlic aioli, and crispy garlic chips. It looked neat appearance-wise, but there was this one piece that kept falling over as if it were too exhausted and had just given up on life. Taste-wise, the creamy avocado blended the flavours together nicely, while there was enough lobster inside for me to clearly taste it. The tuna tataki on top was a bit overdone. In the end, I couldn't exactly say that this was a good deal at $15 (even with the lobster), as there was nothing king-sized or kingly about this roll. 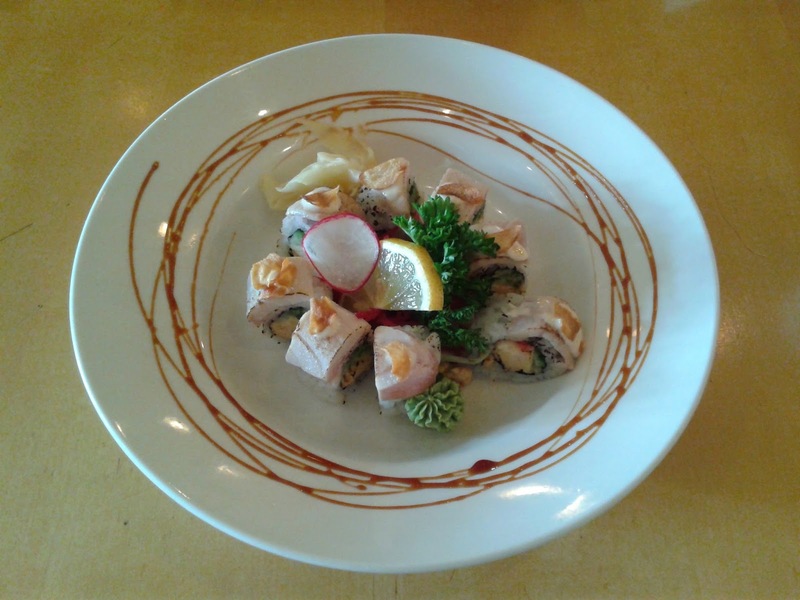 The best part of my experience at Sushi Bella was the service, as my server was polite and professional throughout my entire visit. Even the chefs behind the counter were friendly. 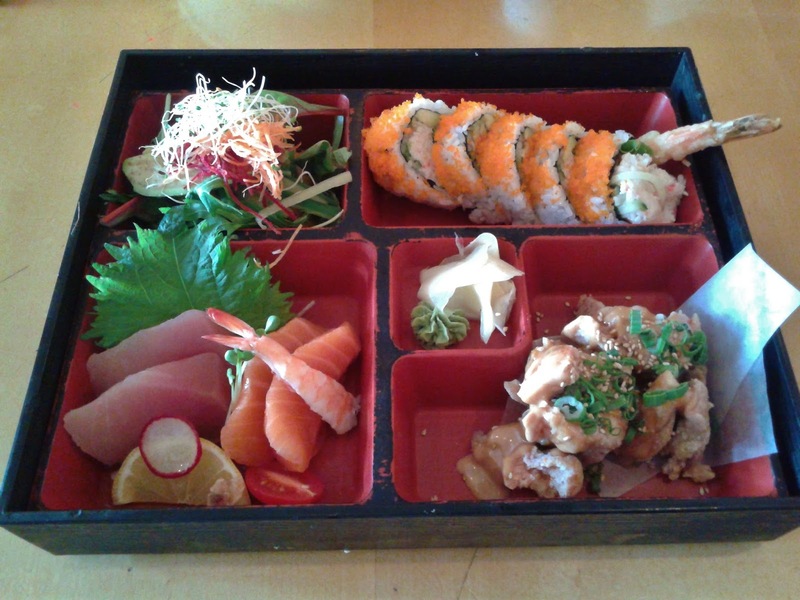 Unfortunately, I found the food quite mediocre, and the knife skills of the sushi chef were certainly nothing to rave about. Furthermore, the food was very expensive for the quality I received. Did I come into the restaurant too early in the morning? LMAO "Okay, that was enough fun with my thesaurus." LOL As a business student, we're not required to use such fancy language, though I occasionally still use a thesaurus when writing my papers, especially when I can't think of the right word to use! LOL I tried so many times to prop it back up, but it just absolutely refused to stand!